6.12 - "Bastien Moreau: Conclusion"
So, Red’s alive. Which we all knew would happen. And I wanted to be more impressed by this episode, but I wasn’t. I mean yes, the band is back together, but I can feel like it’s going to break apart sooner rather than later. 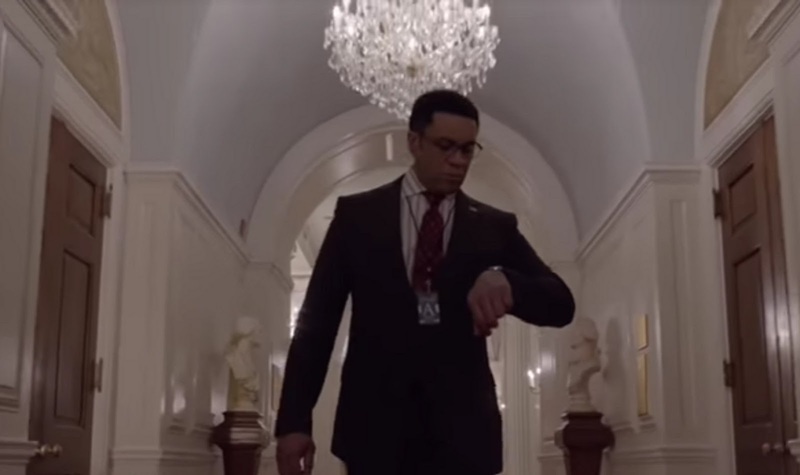 He’s saved at the last minute (more like 30 seconds, really) by a call from the President himself. I wonder who convinced him? More on that later. Fresh from another video call with McMahon and Harold, another agreement is signed by Harold that lets Red out of custody for 48 hours. In that time, he will have to bring the killer of Ava Ziegler to justice or back inside he goes. If he does find the killer, then his immunity agreement will be reinstated. He’ll have to wear an ankle monitor, and if Red commits any crimes while on the outside then Harold will be prosecuted along with him. Harold signs and Red walks out into a beautiful night and into the arms Elizabeth and Dembe. Now he supposes that he should go figure out where The Corsican/Moreau is, because despite what he told everyone he actually has no idea where to find him. Let’s get back to that dossier for a minute, shall we? An MI6 agent had compiled said dossier to give to Ziegler so she could share it with Wade. But which MI6 agent? They must still be alive because the bomb at the UN didn’t go off. Harold has Aram pull up a list of everyone who was in the room where the bomb was supposed to go off. Red arrives at the Post Office, basically waves at everyone, picks Christopher Miles out of the list on Aram’s screen, then scurries off to get his address. He and Dembe go and visit Marty Saperstein (I can’t find him in any Blacklist lore, so he must just be someone Red knew and didn’t want to kill), who is playing Charades with his wife and their friends. Red asks him for Miles’s address, alluding to some potentially embarrassing (and possibly true) facts about Marty in front of his wife about their “time in Greece”. Saperstein runs to his office and scribbles Miles’s address on a piece of paper for Red, and then tells him what a good man Miles is. Red says that he doesn’t want to hurt Miles, just get something he has. The trouble will be if Miles won’t share. He and Dembe, who has been trying to play Charades with the scared Mrs. Saperstein and guests, calls Liz and gives her the address, and Harold orders the team into action. Unfortunately, while Red and the gang are seeking Miles we see him driving in a car with Moreau, who is pointing a gun at him. They go to Miles’s apartment, where he gives Moreau the dossier. Miles promises Moreau that it’s the only copy. Moreau doesn’t believe him, so he shoots Miles in the leg and asks him again, just be sure. Yeah, it’s the only copy. Moreau needs a bit more convincing, however. A witness saw two men going into Miles's building who match Moreau's and Miles's descriptions makes the team sure they are inside. 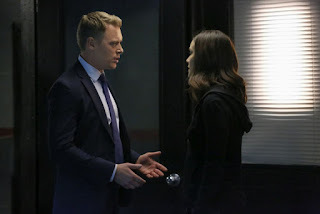 Ressler and Samar lead two SWAT teams into Miles’s apartment, where there is the usual shouting and slamming open of doors and throwing of flash grenades. This is where is goes to hell for Samar and Miles, too. Samar still hasn’t told Harold about her aphasia and accompanying side effects, despite support from Aram and his gentle insistence that he’ll go with her. But Samar goes with the SWAT team instead, sure she'll be able to compensate for her disability. But the loud noises and bright lights overwhelm her senses long enough for Moreau to kill Miles and then escape out of a window. She tries to stop the Miles’s bleeding and while they’re waiting for a medic Miles manages to gasp out that Moreau has the dossier and that the password is Foxglove. Then he dies. Moreau gets away from Ressler with the thumb drive and calls Anna to tell him that he’s successfully acquired the dossier. Anna, however, is still not pleased, and tells him that Reddington escaped from prison and has told the DOJ that he is going to bring in the assassin that killed Ava Ziegler. Now Moreau is unhappy, too, but more than willing to kill Red. If only he knew where Red was. Oh, wait! Anna just happens to have a little device on Red’s ankle that will let any potential killers know where he is at any given moment. Red and Dembe are chilling, as much as Dembe ever chills, in a nice, empty restaurant that Red may or may not have bought out to get a little peace. He takes a call from Liz, who tells him about Miles and Moreau and the dossier and the password. Which Red asks for and is given, even though they have no dossier to open. Or maybe they do. Red isn’t genuinely surprised often, but when he sees Bastien Moreau amble in he's fairly unnerved. Red then tells a long story about tigers and magicians and basically explains to Moreau that he’d been played by Anna McMahon this whole time. She never cared about his agenda, she needed him to further hers. Ava Ziegler wasn’t working to stop nationalism in Germany, she found a plot against the US and Christopher Miles had compiled a document she could share with Wade. To prove everything he’s said, Red gives Moreau the password so that he can read the dossier for himself. He does, and when he’s finished, he is not looking like a happy camper. The plot is against the United States by the United States and has nothing to do with Germany or the German nationalist movement. Red asks whether he can read the dossier, too, since he’s the one who shared the password. Moreau says that it’s enough that he let Red live and walks out. Red calls Liz and lets her know that Moreau’s next target is Anna McMahon. 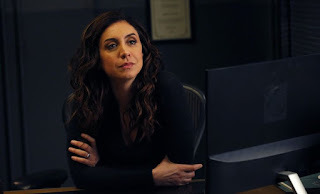 Since it’s too early in the day to drink a toast, Harold sends Liz and Ressler to see McMahon instead while he and Aram search for Samar, who hasn’t been seen since the shooting. Pretending to not know anything about the contents of the dossier, Moreau leaves the thumb drive at a predetermined location and tells Anna that killing Reddington will take time. A young courier picks up the thumb drive and takes it to Anna’s where Moreau, who has been following her, stabs her to death. Then he breaks into Anna’s house and puts the body in a chair in her dining room, so Anna will see her as soon as she comes in. Now there’s nothing to do but wait; which Moreau does, settling down into one of Anna’s no doubt pricey but comfy living room chairs. Busy, tired Anna schleps home, ignoring calls from her office and telling someone on her cell phone to tell everyone she’s busy. I’m guessing she’s looking to unwind. Won’t happen. When she sees the dead body, though, she knows that Moreau can’t be far behind. And he isn’t. He argues with Anna about how she used him, how she convinced him that she was part of the Black Fist (German nationalist movement) and that the dossier Miles compiled for Ziegler, which was purportedly for taking down the nationalist movement in Germany, had nothing to do with that at all. Moreau is a nationalist to the core: nothing else really means anything to him. A person who helped compile a dossier that risked taking his party down? That he cared about. That he’d kill for. But frankly my dear, a plot to harm the US? He didn’t give a damn. And it becomes clear that Anna McMahon had been manipulating him his whole time. She needed some work done, so she hired the best. It was just a matter of giving him the right motivation. Moreau wants to know why the whole dossier is about a plan Anna has to harm her own country. What’s in it for him? Nothing, really, as it turns out. While they continue to argue they hear tires screech to a halt outside and Moreau escapes while Anna plays the hysterical victim and tells Liz and Ressler that there was just some man in her house, she has no idea who he is. Blah, blah. Liz takes off on foot and Ressler grabs the car to hunt Moreau down. Now this is a pretty neat party trick. Moreau decides to make something disappear, possibly forever. As he passes a mother and son walking in front of him, he takes the thumb drive with the dossier on it and slips it into the kid’s backpack. What does he care about it, anyway? The dossier means nothing to his cause and therefore nothing to him. When Liz and Ressler finally capture him, Moreau tells them that he’ll be an asset to them because he has a secret, which we’ll never know anything about from him because at that moment the guy with the heavy eyebrows from the White House kills him dead with a sniper rifle. And you know that nobody will find Moreau’s killer, and that Moreau has taken the contents and location of the dossier to his grave. Aram finds Samar looking out at the city from the rooftop of the Post Office, smoking. She’s going to tell Harold what’s going on with her and, when Aram tries to make out that being with Miles in the end was a brave thing, she tells him that it wasn’t good and romantic at all. However, when she meets with Harold Samar simply tells him that she’s resigning from the team and no, she won’t tell him why. She gives him a big hug and gets teary telling him how much she’s loved working on the task force. Then tells him goodbye. Like, goodbye-goodbye or, “Come over on dinner on Friday, can I use you as a reference” goodbye? I’m not sure, but I’m worried about Samar. So, Red is back! He found the person who killed Ziegler and now his immunity agreement is back in force. He does need to pretend that he escaped from prison instead being pardoned, but Red’s a big picture guy. Best of all, as part of his agreement Vontae gets out on parole!! I wonder what Red’s going to have Vontae do for him now. Harold is excited for Red and everyone on the task force, giving them an overview about how much tougher their jobs are going to be now with more oversight, but they’ll just have to be stealthier and get creative. Thanks for the pep talk, Harold, but Red can only stay a minute because the Post Office smells funky and he must be going. Wheels up in 45! He’s not sure where he’s going, but I have an inkling that dinner in Chicago might be on the agenda. Liz is largely silent in this episode, aside from giving Red a big hug which I thought was primarily genuine. Strange to see an episode that isn’t Liz-centric. Very good, but strange. She participated in the capture of Moreau and got some of his guts splattered on her when the sniper from the White House shot him. Early Liz, when they were often mindlessly following Red as they tried to figure out the puzzle. Did anyone else feel that Liz was manipulating Ressler into doing what she decided she couldn’t or wouldn’t? Ressler: The reason you didn’t ask him who he really is, uh was it because you didn’t get the chance to or because you decided not to? And I think she gently touched his hand as she walked away! You work the skills your Daddy taught you, Lizzie! At last we see Harold and McMahon in his office, getting ready to sign off on Task Force’s part of Red’s immunity agreement. Anna wants to make it clear that if Red commits any crimes that anyone on the Task Force knows about, they’ll be tried as co-conspirators. Oh, and she’s going to continue to oversee the task force. Did she before? Whatever. Harold has some thoughts on that. Anna: Once again, my job will be to oversee the Task Force for Main Justice. Harold: I’m looking forward to that. Anna: Your sarcasm is duty noted. Harold: And yet, I’m being completely genuine. Anna: You want me to take the job? Harold: I do, because it’s proven to be one with an extraordinarily high mortality rate. Oh, and speaking of Harold, is anyone else kind of pissed at the way Red treated him? Harold risked his job and possibly his life to keep Red alive. He blackmailed the President into staying the execution because Harold promised to go to the press with the fact that a high-ranking German official died on US soil and the person who could have prevented it was allowed to die by lethal injection. He signs anything anyone puts in front of him to ensure that Red and the Task Force continue to exist and Red barely says a thing to him throughout the whole episode! Red’s hobbies do include his ability to seem nonplussed by basically everything, but his casual attitude to his last-minute save by a call from the President really irked me. What was it he said to the Warden? “People make their own luck, some more than others — I make a prodigious amount.” Red, I know you think that the reason you always come out on top is because the people who work for you do their jobs and do them well. But Harold saved you, Red. Because he believes in the work you’re all doing, and because you’ve grown on him. And you don’t get that kind of loyalty from someone who’s just cashing a paycheck. Would it have killed you to pop up to Harold’s office with a gift of expensive whiskey for a drink together, or maybe take him to Chicago for an enjoyable dining experience? I know that Red may feel the “absolution” conversation he and Harold had in the last episode may have been Red saying what he needed to say emotionally to Harold forever, but I still think he owes Harold at least a nice cigar. What is the plot against America? I feel like it has something to do with starting a war. What is up with Anna telling the President to “Say hello to the First Lady for me,” Hummm? I think Anna’s most likely just sleeping with him, but part of me wonders whether he was blackmailed into doing whatever is going to happen to the country. Why doesn’t Red encourage Dembe to have some fun once in a while? He needs to get out more and just kick back. Did you see how much fun he had trying to play Charades at the Saperstein’s? I’ll bet Dembe would own a Pub Quiz.